I just buried my father yesterday. Well, not literally, since the service was held in a chapel at the cemetery, but my family and I said goodbye to him in a traditional Christian service. 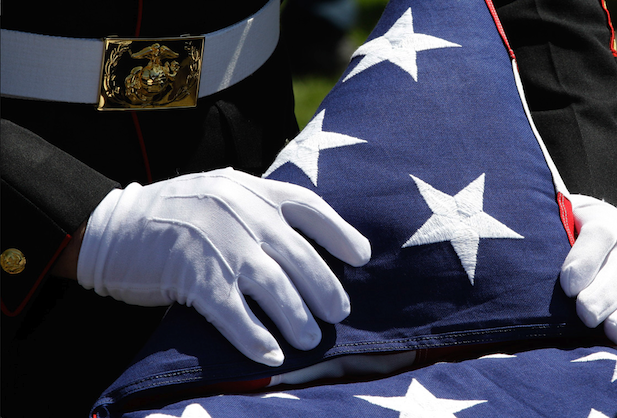 Because he was a combat veteran Marine Corps sergeant major, he received also very impressive military honors at graveside. It was quite nice. Although he had passed rather quickly, and completely unexpectedly, he had lived a long and full life. That sounds cliché, but during his 84 years he had a successful career in the Corps, enjoyed a long and peaceful retirement, was blessed with a loving and faithful wife, and found great joy in his three children, nine grandchildren and ten great-grandchildren. Best of all, though, after what some would call a rather misspent youth, he became a good man . . . and ended his days with faith in Christ and with virtues such as repentance, forgiveness and charity evident in his life. As the day of the funeral was approaching, I recalled one of Jesus’ conversations with several prospective disciples. As they were going along the road, someone said to [Jesus], “I will follow you wherever you go.” And Jesus said to him, “Foxes have holes, and birds of the air have nests, but the Son of Man has nowhere to lay his head.” To another [Jesus] said, “Follow me.” But he said, “Lord, let me first go and bury my father.” And Jesus said to him, “Leave the dead to bury their own dead. But as for you, go and proclaim the kingdom of God.” (Luke 9:57-60, ESV). To some, Jesus’ words here sound harsh. However, the Messiah was not encouraging people to cease honoring their parents. After all, that would be in direct disobedience to the Commandments God delivered to us through Moses. No, Jesus affirmed our call to respect and care for our parents. What he was condemning was the excuses we make to delay accepting his invitation to follow him. And you, you can’t even get out of bed. Most of us live long enough to suffer the loss of a parent. It’s something, perhaps, that you don’t really understand until you experience it yourself. Even then it’s difficult to console others by saying we’ve shared their loss. After all, every relationship is unique, and each human being processes grief in a unique manner. C.S. Lewis knew well what it was like to lose his parents. His beloved mother died when he was quite young. In Surprised by Joy, he describes the pain. With my mother’s death all settled happiness, all that was tranquil and reliable, disappeared from my life. There was to be much fun, many pleasures, many stabs of Joy; but no more of the old security. It was sea and islands now; the great continent had sunk like Atlantis. Thanks for sharing on this topic so close to your heart, and loss. Blessings to you as you remember fondly the times you spent with your dad and honour his memory. May your father’s soul rest in peace. And may you hold on to the courage and faith needed to move forward. Take care of yourself. I was told by a professor that the statement about burying the man’s father was not related to burying a man who had just died. Rather the man wanted to wait and stay home until his father was dead and he could handle the responsibilities related to that at that time. There is certainly always a reason to delay giving our all to Christ if that is our mindset. That is the most common interpretation of the passage. Of course, I don’t have the space to get into too much exegesis here. Ultimately, of course, the point is the same. Thank you, Kristen. My heart goes out to you on losing your dad. My father passed away 8 years ago and I am glad to say that he was the one who showed me God’s love. A life well-lived, the best legacy. Well Rob, I am sorry for your loss. This is a lovely note. Thanks for this wonderful article. My deepest condolences on the loss of your father and my deepest gratitude for relating and expanding on the story from the New Testament. I have lost by of my parents; my mother most recently. I have experienced that sense of loss. Peace and joy to you and your loved ones. Rob, Thanks for these words both of grief and of faith and thanksgiving for your Dad’s life. God be with you. I buried my only child on the 22nd of January 2013. My father passed away 20 months earlier and my mom 15 years ago. In the week before my Vic passed she saw her Gramps and she also said her room was full of angels. I still miss my parents and i will continue to do so until the day I die. My life without my child is so unimaginable that I cannot even begin to contemplate the rest of my life. …and I imagine it will be some time before the future even seems worth living. I cannot pretend to comprehend your pain now, because we all know our children should not pass before us. In reading the entries on your journal, it’s clear you gave her the precious gift of walking the Valley alongside her. And we can take comfort in her vision of God’s angels surrounding us as we prepare to die. That is a common experience for Christians, and I hope it will be my own as well. I’ll be praying for you. Sorry to hear of your loss. It is the strangest of feelings when you bury your parents and then see that you are now the patriarch. Enjoyed your post. Blessings. Thanks. An excellent article–as one can always expect from Touchstone! I am so sorry for your loss. A life lived well is a profound loss, but the memories and the hope of the resurrection are a balm. That Keith Green lyric always slays me. Beautiful tribute and I’m so sorry for your loss. I’ve lost both of mine much too young. My father first, then my mother 11 years later. You feel like an orphan. Lewis’ words in the loss of his mother ring so true. She listened as I rambled on and on about every minute detail of her grandchildren. How I missed that! With my father, it was the loss of wisdom and guidance always there when my husband and I could not find answers. Yesterday I lost a friend to heaven, way too young, a great man. But we grieve not as men “who have no hope”. The greatest gifts, however, can be found through loss. For as the years have come and gone since those losses, so God has provided other cherished friends to take their place. My siblings and I are closer than ever and my dear sister listens as I ramble on and one! He never abandons us, does He? May you find comfort this day and the days ahead. May you recognize as God provides the void left by your dear father. Thank you for this reflection, Rob. While I pray that the Holy Spirit be your comfort, I rejoice with you for your father’s reward in Heaven. You’ll see him again, and I plan to meet both of you there as well. So sorry about your dad. My grandmother once said at funerals we weep for ourselves as we are left behind and they are already in glory. It’s hard to lose a father. And to become an orphan. Condolences on the loss of your father and thank you for elucidating the meaning of that passage in Luke, which has always surprised and confounded me. Beautifully written and so true. Thank you.